JERUSALEM (CNS) — Christians in Syria are continuing to be targeted by outside fundamentalist groups who have joined the country’s long civil war, said the head of the Syriac Catholic Church in Jerusalem. 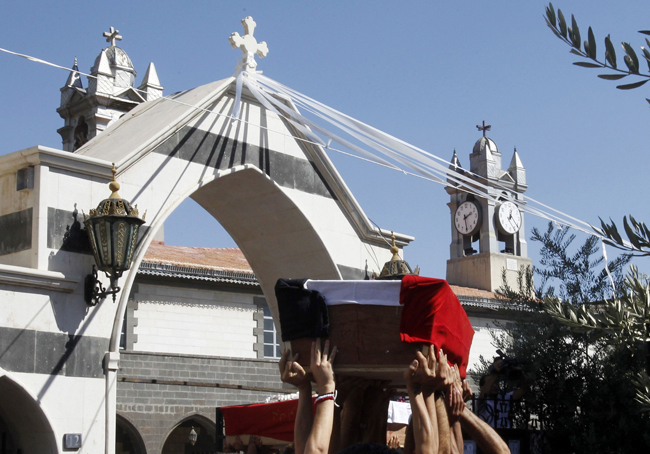 Bishop Boutros Melki, Syriac Catholic patriarchal vicar, told Catholic News Service Sept. 18 that Christians fear that the situation in Syria will become like that in Iraq, where half the Christian population has fled since the American-led overthrow of Saddam Hussein. In an interview after returning from Montreal, where he met with Syriac Patriarch Ignace Joseph III Younan, the bishop said the historic city of Maaloula, with its ancient churches and monasteries, became the site of fighting between rebel and government forces. Attacks against churches and Christian homes occurred and Christian icons and crosses were destroyed and defamed, he said. Several priests as well as bishops have been kidnapped over the past six months and have not been heard from since, he said. At least one priest has been confirmed killed. Christian civilians are also being targeted for kidnappings and shot by militias, he said. Foreign “jihadists,” Bishop Melki said, are coming from different countries with the impression that the Christians in Syria are “kafirs,” or infidels. Christians are not immigrants in Syria but have been in the country since the beginning of Christianity, he said. The bishop said countries such as Iran, Saudi Arabia, Qatar, Turkey and European nations who are “pushing” people to fight each other could easily lower the levels of bloodshed in the country by simply refusing to sell weapons to either side. “Those who are fighting each other, with which arms are they doing that? Where did they buy them?” he asked. “I can’t defend anybody, not the regime and not the opposition,” Bishop Melki added. “I am really just talking in a human way when I see all this suffering and destruction (and) I say why? “Can we have anything good with these people? Unfortunately, the media targeted the Christians as pro-regime (of Syrian President Bashar Assad). We are not for one or the other. We are looking at the reality … as in Iraq we are not for Saddam Hussein, or here Bashar Assad. We are for the human being,” the bishop continued. Meanwhile, it is impossible to know how many of Syria’s Christians have already fled to other countries, he said. Calling the Russian-brokered agreement with Syria “a start” the Syriac Catholic leader said world leaders must continue to push the Assad government and the rebels to negotiate a permanent peace deal. He said church leaders are hopeful the Syrian government will respect its commitment to collaborate with the United Nations in eliminating its chemical weapons arsenal. “We pray that the agreement can lead all factions to Geneva and make pressure on both sides on the regime and the opposition to dialogue in order to get a new democratic government assuring are liberties and rights to all citizens,” he said. “Dialogue is the only way for us and for everybody … Let them find a way of accepting each other and finding a new regime for Syria. Bishop Melki also said it is his responsibility to keep Christians confident about their place in the Middle East, despite the challenges they face in many parts of the region. “Christianity started here and it won’t disappear from there. We have to encourage our Christians to be strong,” he said.